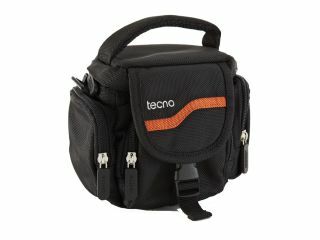 Jessops, the photographic retailer, has introduced a new range of Tecno camera bags, which includes those for compacts and DSLRS. The new range features seven new bags, two Tecno Shoulder Bags, two Tecno Rucksacks, a Techno Holster case, a Techno Compact case and a Tecno Gaget bag. The bags have been specially designed to meet the needs of a wide variety of customers. Prices for the bags start at £15.95 for the smallest case. The Tecno Compact Case features a tough, water-resistant outer fabric with a soft fabric lining along with a dedicated memory card compartment and an accessory compartment for extra items. A shoulder strap an belt loop is also included. The Compact Case is available in two sizes. Moving up the range, the Tecno Holster Case and Tecno Shoulder Bag are designed for compact system cameras and DSLRs with lenses attached. The outer fabric is water resistant, while the inside also features soft lining. Memory card compartments and secure zipped pockets along with a padded carrying angle and adjustable should strap is also included. The Tecno Gadget Bag is the successor to the Jessops Trek 2 Gadget Bag which comes with a shoulder strap and several side pockets and internal storage areas. The outer fabric is a tough nylon, again with soft inner lining. Finally, the Tecno Rucksack is designed for DSLRs with a lens attached, with room for an additional three lenses and a flashgun. The outer fabric is water resistant, while the inside features dedicated memory card compartments and two padded camera compartments. A handle and adjustable shoulder straps are available. The Rucksack is the most expensive bag, coming in at £39.95.